BioLite makes the great outdoors so playful and FUNCTIONAL! What started with their first product the CampStove (that was innovative in letting you not only utilize all the twigs and material found around camp to power your stove while also let you charge your devices!) has quickly expanded to quite the product line! Also - they always have such great packaging. On recent product trends that have been exploding - LEDs in versatile, portable, outdoor lighting have been EVERYWHERE! And it’s been a fun space to follow (remember the Luminoodles i’ve been loving?) 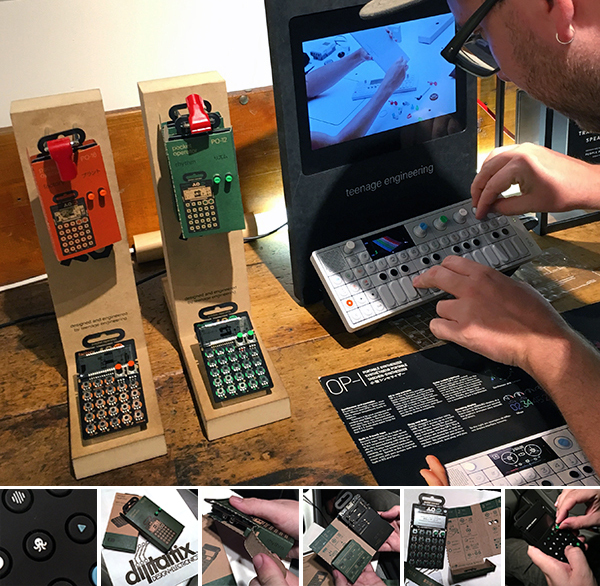 - From buying led strips to hack into our NOTFZJ80 Land Cruiser, to working them into various client projects and experiments - they are just ridiculously easy to work with, and getting cheaper and more accessible constantly. Which naturally means that they are a great place for designers to get even more creative! When BioLite offered to send some of their new lights over, i couldn’t resist. 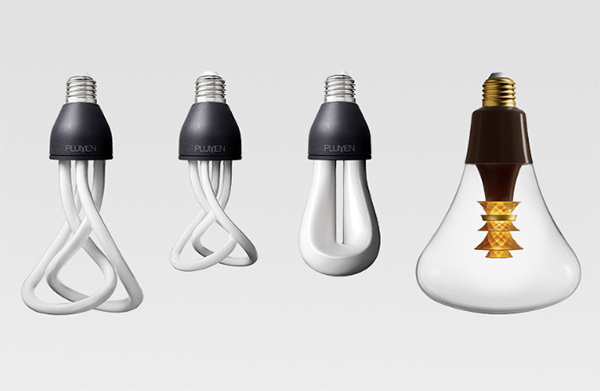 How adorable are these SiteLight Minis? They are like adorable glowing macarons that plug right into a USB port (via a headphone jack). They also sent over the SiteLight XL which pops up like a lantern and can be daisy chained with the minis or stand on its own! And to power it all (though you can power them from any USB battery or plug too! ), they also sent over the Base Lantern XL which is INSANELY bright (but can be dimmed,color changed and more with the buttons and app!) Anyhow, the whole collection is adorable, functional, and definitely on my gift list for outdoorsy folks (or even for use on patios or stringing up for a happy hour picnic under a tree!) Take a look at all the unboxing and details on the next page! 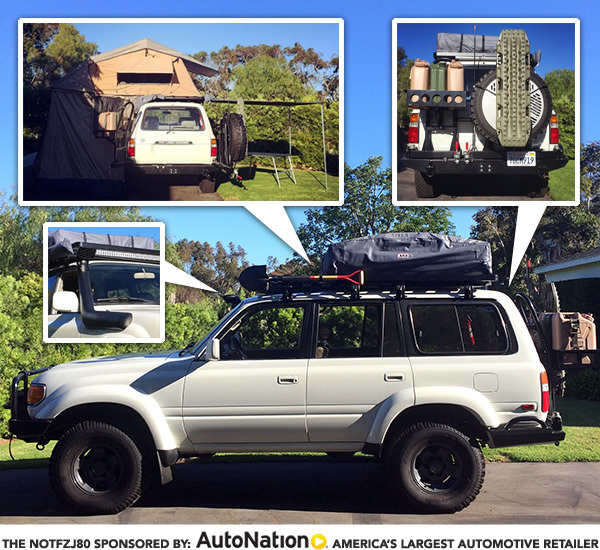 It all started with Shawn telling me about how we “could” drop Chevrolet LT1 E-ROD crate engine into our ‘96 Land Cruiser for our next step in our NOTFZJ80 Project… of course my first question was, “What does it feel like?” which prompted him to tell me it’s in the Corvette Grand Sport! So, when Chevy offered one to us for a week, it was the perfect way to kick off 2017 and try the LT1! 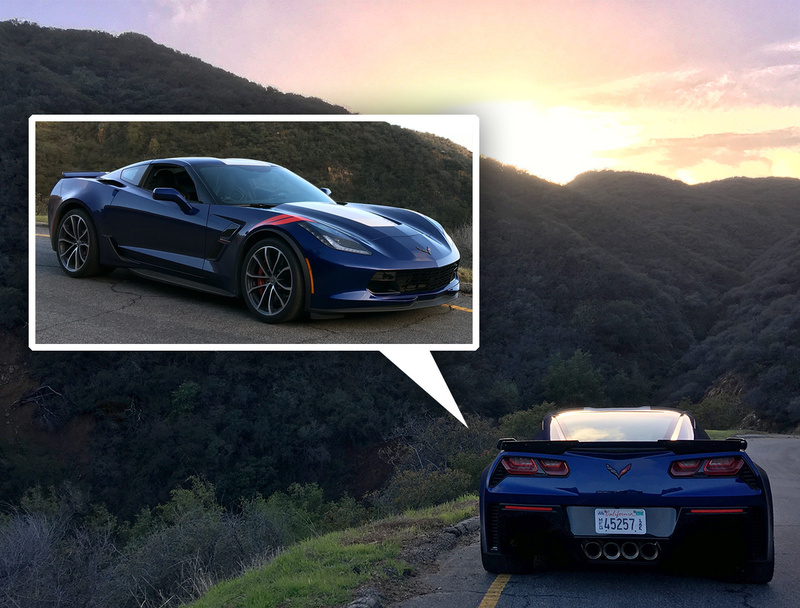 First impressions of the 2017 Corvette Grand Sport? So fun to drive, and it turns (surprising) heads everywhere you go. There’s something about styling (much like the original stingrays) that just makes people stare, grin, and wave… from little boys to old ladies, to everything in between. It was hard to stop in anywhere and NOT get asked about it. For lack of a better phrase, it definitely had a more all-American-all-ages vibe from the crowd it drew, compared to some higher end luxury sports cars. Even non car folks were excited by it. But to be honest, it is SO fun to drive, that the only time you notice all the grins and stares are while being a passenger. That sport mode on S curves is fantastic. And the touring mode was surprisingly comfortable for such a low car with a stiff suspension! While we can’t give you a ride, we can show you all the details that we love… so take a peek on the next page! Full disclosure - Daniel Frysinger works on the Linksys Velop, and he also founded NOTCOT with me and we’ve been friends for nearly 20 years! Weirdly enough, that means instead of being positively biased, we’ve been even MORE critical of the product (what else would you expect from designers? ), and have let him use our home and studio space as testing areas, and turn us into UX guinea pigs while working through the design process! So when it finally made it to store shelves, we had to share unboxing it with you! 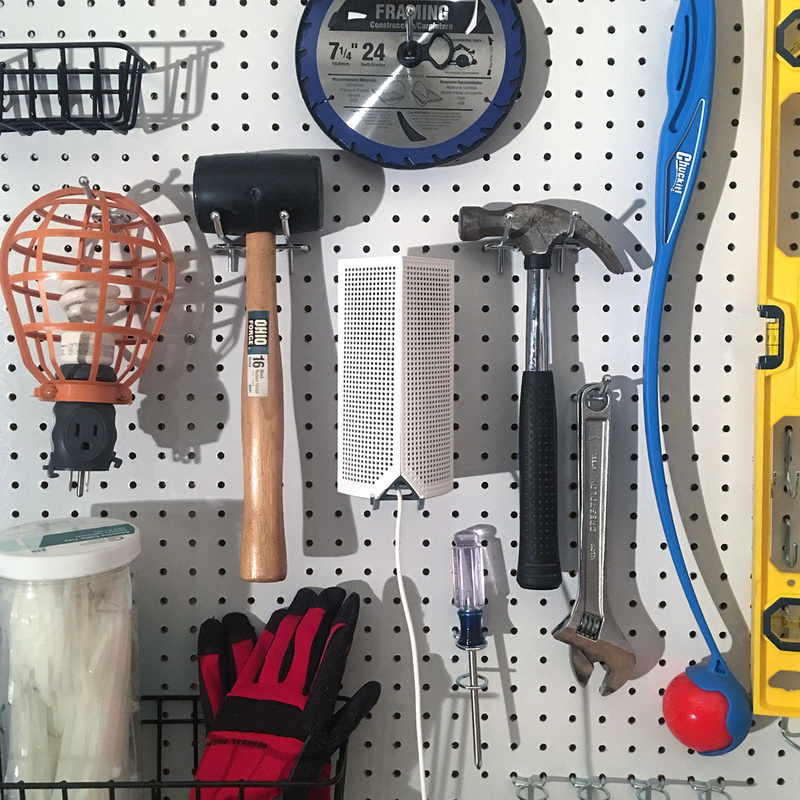 So that being said - i’m totally in awe of how good my internet connection finally is in the garage workshop and the pergola/deck… and every corner of the yard/driveway… even the furthest bedrooms are solid now! Mesh networks are definitely a hot trend/evolution in the home wifi router space, and they all seem to advertises how many nodes you need based on the size of your home to properly reach ALL the spots we hang out - both inside and out! With 4-5 Linksys Velop Nodes we cover ~13,000 sqft inside and out amazingly well, and it’s nice that you just need a power cord and close enough proximity to another node to expand coverage. Each node has 2 ethernet ports, so you can easily hook up an ethernet drive or other hard wired accessories where needed. Also, all nodes are equal - no master/slave situation, so they are completely versatile. In other words, if you move and find you need less nodes, you can always share them with a friend, or use them for better wifi at your vacation home. The other fascinating wifi router trend is an industrial design one! They are finally getting prettier and more interesting as designers help consumers display (instead of hide) their routers. It makes perfect sense, the more exposed and centrally located they are, the better signal you get! Yet somehow, many of us have had them stashed in closets and behind objects on shelves and more. So while the Linksys Velop Nodes aren’t the tiniest, they are filled with thoughtful design details. (Also, when it comes to my wifi, i’ll take slightly larger router with WAY better signal any day.) While most press photos show you the plain, solid, white side with a logo, my favorite view is actually the back at an angle. There’s something almost sculptural with the perforated white square/squircle (?) tower with the cut out corner! On to the unboxing and up close with the design details! To the next page! 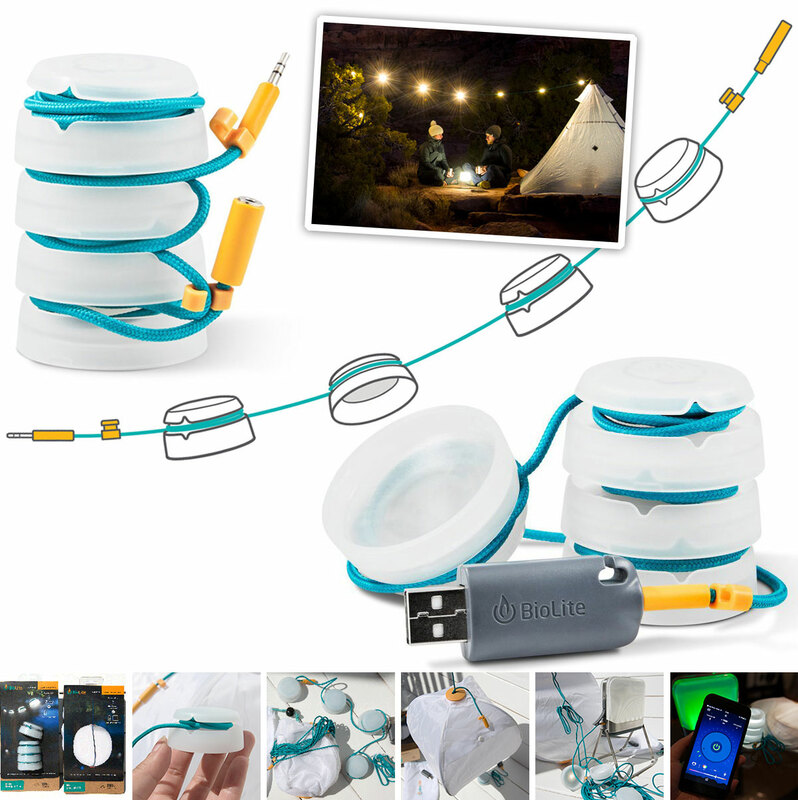 The Power Practical Luminoodle! 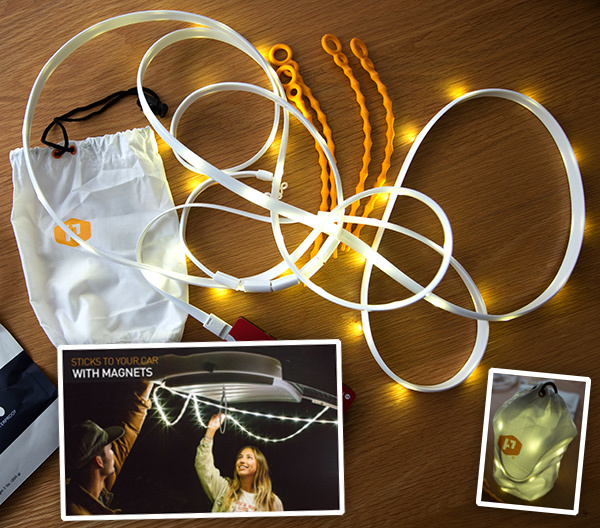 Essentially an LED strip that you can power via USB - and before you just buy a basic LED strip and hack it together yourself, they’ve already done the work to make this waterproof with a nice light diffusion, attached adjustable magnets, included straps to attach it to things, and a little white stuff sack that can turn into a lantern. Basically - it’s an awesome stocking stuffer and gift for your campers, road trippers, cyclists, and more. 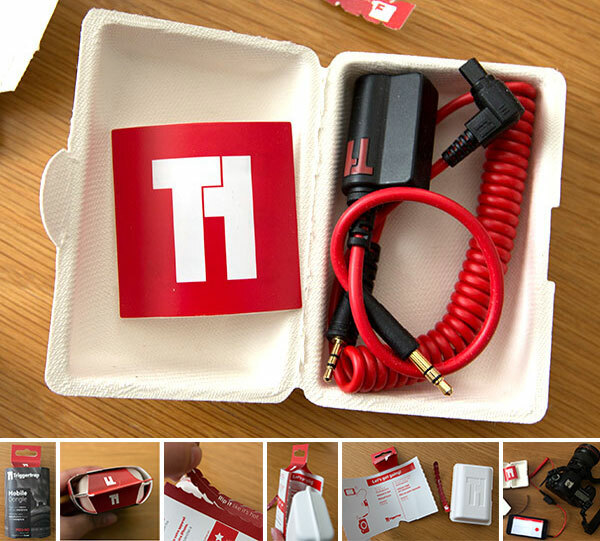 Also, being USB powered, its easy to plug it in to anything from a USB wall or car charger, computer, or even that back up battery you probably carry for your phone… and for those who don’t already have somewhere to plug it in, you can also buy the Luminoodle Plus that includes one. (Ooh and for last minute shoppers, they are available and slightly cheaper with Amazon Prime! While skeptical at first, i got curious while black friday shopping and impulse bought one… and i’m delightfully impressed with it! Such a simple idea, executed so thoughtfully, they’ve really elevated the LED strip in a lovely, functional way. Also, nice packaging! Take a peek at the details and unboxing on the next page. Snapchat Spectacles are having a moment… in fact i can’t imagine a better name than “spectacles” with the way they are launching and dispersing their foray into hardware this insane holiday week. When the WSJ article is titled “Snapchat Spectacles Take Video, Cover Mortgage Payments” you know it’s madness. 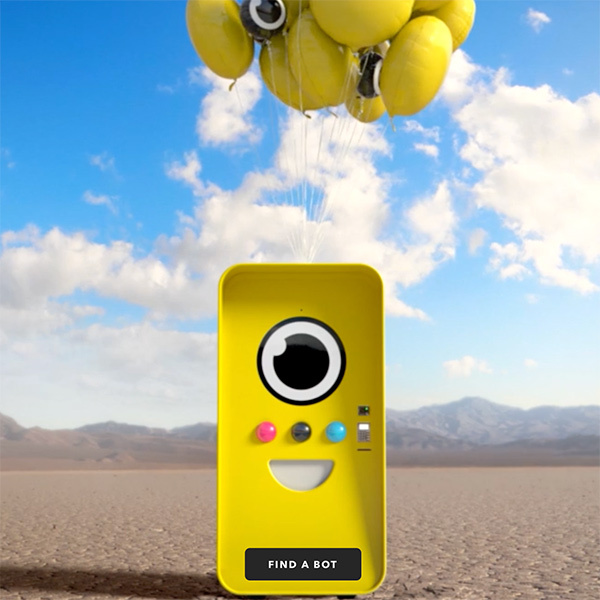 Short story - only way to get them is currently through their adorable minion-esque vending machines that are popping up across America, and you find out where they are on their Spectacles Bot Map, but when they pop up, get there fast, rumors are there are only 200 or so in each one, and they sell out in under 2 hours? Also expect lines around buildings… they are all over eBay for $500-1000 (and you can swipe your credit card at a SnapBot to get one for $130) All this insanity as they get ready for a rumored IPO… and the Spectacles resell bubble may die down as their NYC store restocks more often? But, lets look at the SnapBOT! It’s adorable, beautifully poppy and minimal, like a giant rectangular minion beeping cute noises and barfing out rainbow receipts (how very snapchat?) So when Shawn woke me up that the SnapBot was just over at Brentwood Countrymart - we popped out of bed and headed over - figuring worst case we could see the madness and grab a coffee. Apparently the bot landed around 7, and the line was already a few hundred deep at 8:30. It was quite the diverse crowd - and people were already scheming what they were going to do with the money they made reselling them… So with cappuccino in hand, we headed to the bot - just follow the balloons! And it was appropriately placed right in front of the toy store! With its big blinking eye that matches the Spectacles logo and the camera/led on the glasses - it’s a great interaction for the buyer and those waiting around the machine. See more pics and video on the next page. 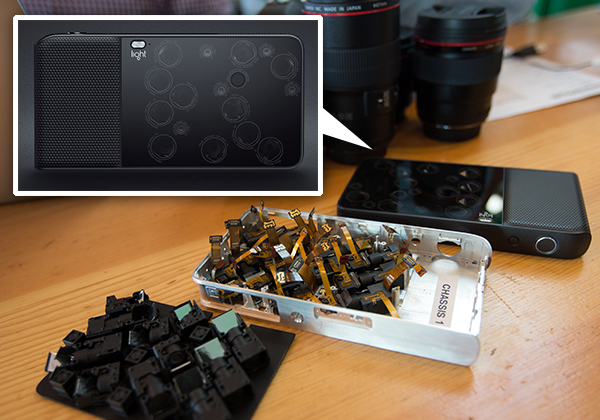 Light launched the L16 Camera today - a “multi-aperture computational camera that packs DSLR quality and capability into a device that fits in your pocket.” I had the opportunity to get up close with the prototype a few weeks back, and peek at what is actually INSIDE this fascinating camera. The potential is awesome, but i’m definitely curiously skeptical about the “computational camera” aspect. Basically this camera is a collection of 16 cameras in one - all simultaneously shooting an image at multiple focal lengths then fusing the resulting images together for a single image (up to 52 megapixels) which means you have all the data to manipulate the depth of field, exposure, and more after the fact. What Light L16 promises may remind you a bit of Lytro, but what makes it immensely more intriguing to me is the form factor and peeking INSIDE of it! The 16 cameras are supposed to be exceptional for low light and give you the equivalent of 35-150mm true optical zoom. Aesthetically it resembles something between a large touch screen cellphone and a bluetooth speaker/radio… with 16 eyes staring at you from the glossy face! The size is quite a bit larger than most big screen filled phones. Trading in my DSLR for this form would definitely be quite the adjustment… so the real trick will be seeing not only how it shoots, but how their software works into photographers work flows. To make the most of the Light L16, it’s all about taking advantage of the post processing that is possible in their proprietary file type that houses the immense amount of data captured with each press of the shutter. Of course for quick manipulations or exports you will also be able to send files like jpgs to your phone or laptop for quick sharing. The potential is huge, and i’m definitely excited! Chatting with the Light L16 team, future possibilities were easy to imagine - putting this technology into cars, cellphones, and beyond! The future of the technology side is a no brainer - the user experience of shooting with it, processing/developing images with it, and having it nestle its way into my workflow i’m dying to find out. Take a peek at the details of what is inside the Light L16 as well as the intro video and how it’s made on the next page! We’ve been in the getting-to-know-you phase with this “desktop” beast of a CNC recently, but to catch you up - here’s the unboxing of what two shipping palettes in the driveway is like. We definitely needed to bring in an extra pair of hands to help move the machine itself. 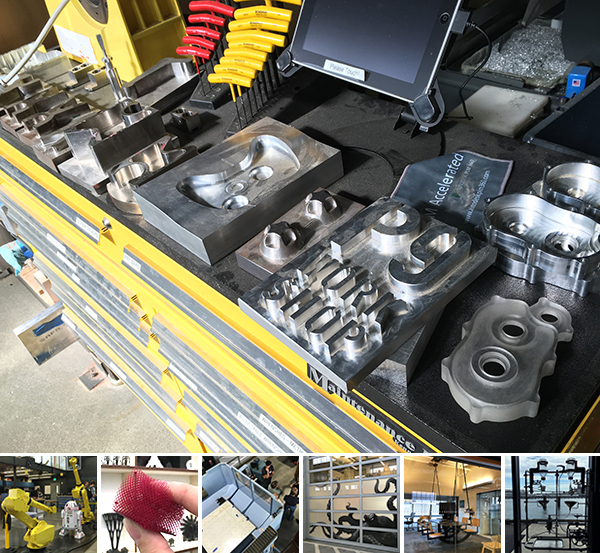 In addition to the Roland MODELA Pro II MDX-540S main mill, there is the case, the automatic tool changer, the rotary (4th axis!) and then a starter set of various bits… and of course, Roland’s software to get to know. Ooh and then there’s also various materials to try! First impression? SO MESMERIZING! 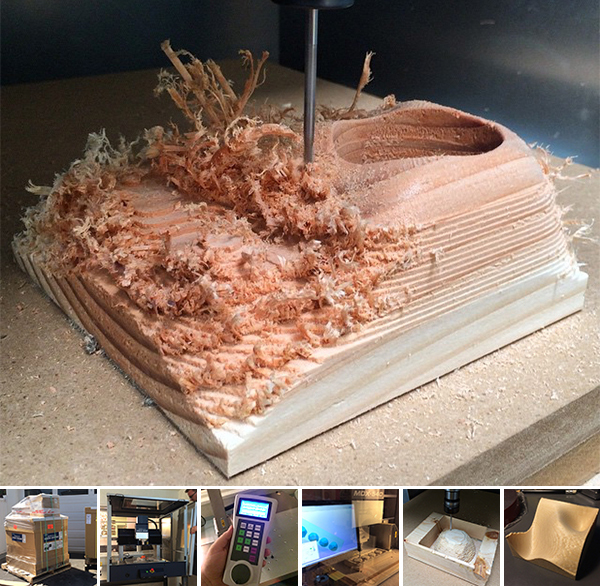 We’ve been spending hours and hours working alongside the machine to keep an eye on things, and experimenting with a few models to test out how it handles various types of curves, materials, and details. 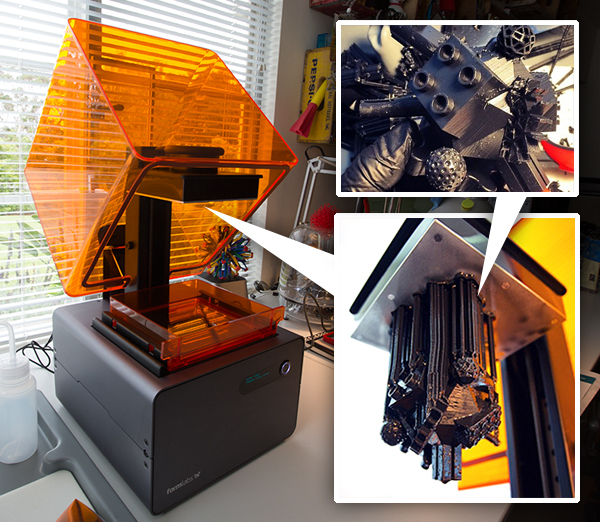 See the full unboxing and a peek at our experiments so far on the next page! “IF IT’S BROKE, FIX IT!” That’s the motto of the Patagonia Worn Wear initiative. While the creation of new things can not be 100% waste/harm/etc-free, we can do our part by using things for as long as possible and consuming less! And a huge part of that comes from taking care of the things we have - from cleaning and caring to repairing when needed, especially when it comes to clothes! 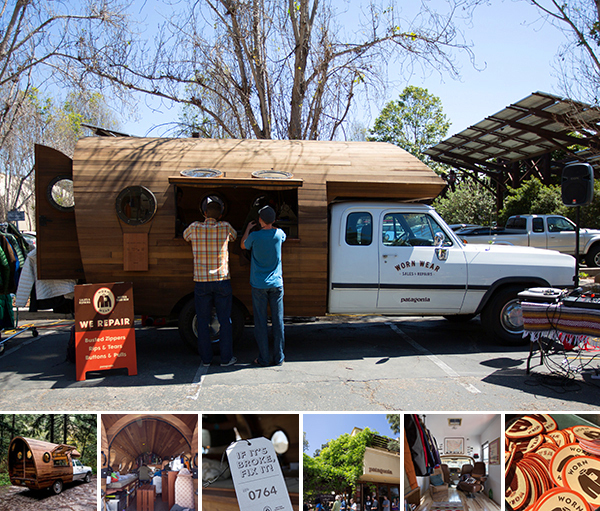 So yesterday we joined Patagonia at their Ventura, CA HQ for the launch of the Worn Wear TOUR!